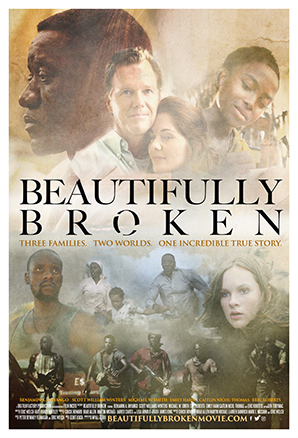 Beautifully Broken is the true story of three families, from different countries, each struggling to find hope and safety amid the devastation of war. Their lives become intertwined, realizing that helping others can change the world around them and the world within them. Action begins the journey with a father, William Mwizerwa, fleeing the dangers of the Rwandan Genocide. Running with his wife and daughter, they narrowly escape death from machete and gun wielding soldiers. Finally entering a Kenyan refugee camp, William learns of a program that can take him to America; however, he must go alone to establish residency first. Despite his reluctance to leave his family in Kenya, he and his wife decide they must try this unpredictable plan. Once in America, William meets another father facing his own challenges. Randy Hartley is a family man, driven to succeed in business at all costs; however, his faith is tested as his daughter, Andrea, rebels against he and his wife. Andrea's changing attitude is a result of a secret tragedy that she will only reveal to a pen pal that happens to be a Rwandan girl, Umuhoza. As Randy and William grow in friendship, they inspire and try to help one another keep their families together over several trials. Ultimately the men develop an outreach center helping other refugee families from war torn countries, which eventually brings William's wife and daughter to America. Yet even as William's family reunites, Randy's world is crumbling. He confides in William, asking him to take his family to Rwanda in hopes that his daughter will open up once again after meeting her Rwandan pen pal. Reluctantly, William returns to Rwanda where the dangers of the past haunt his family, yet also bring answers and redemption from the 1990s genocide. As the film concludes, Randy and William's families surprise Umuhoza and her parents at a coming of age celebration for the young girl, allowing Andrea to meet the pen pal who changed her life. Themes of forgiveness and reconciliation bring an emotional ending as William discovers the militia soldier who saved his family during the war, acknowledging that if everyone believed in the concept of "an eye for an eye" the whole world would go blind.